If you're in the catering industry, you must have food hygiene training! Karis Training Food Hygiene is a provider of Level 2 Food Safety in Catering courses to the public. 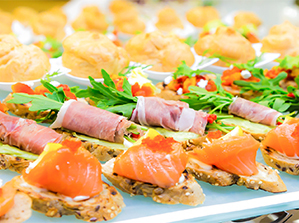 It is a vital course for anybody working in the catering sector. We offer Level 2 Food Safety in Catering courses which can be taken alone at one of our centres or as a group of 10 or more at a time and location of your choice! We provide the course at our training centre each month but we can also provide training courses at a venue and time of your choice for 10 or more people. Karis Training pride themselves on the ability to teach effectively and help students pass. The course content is superb and allows students to fully grasp the information provided. With great discussions and superb course content, you can qualify in a single day. The qualification is well recognised and will certainly be a boost if applying for a job. INTERESTED IN BOOKING ON TO A COURSE? GET IN TOUCH. Book On To A Course! We’re here to help answer your questions. Booking a training course can be a nervous time but we are here to make it easy for you to learn and qualify. venues) or if you have a group of 10 people or more, courses can be held at a time, date and venue that suits your work colleagues at affordable prices.